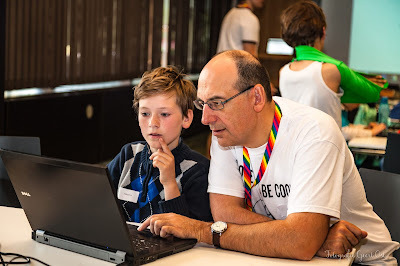 Laughter, twinkled eyes and cool coding projects, that’s basically what CoderDojo is all about. So why don’t take our concept to kids that can really use it? That's what coach Reinhart was thinking. So he teamed up with CoderDojo4All project manager Roos and Eeklo lead coach Marijke to initiate a pop-up Dojo in the Red Cross refugee centre of Eeklo in an attempt to let these kids share in the joy of coding. On Saturday 8 September a road team mostly consisting of volunteers from CoderDojo Eeklo, set up a Dojo in the refugee centre. The centre’s staff was very enthusiastic and greeted us with open arms. No less than 19 participants joined us for their first coding experience. They started working in Scratch and discovered that creating their own Scratch game is surprisingly easy. Some even wanted more. Ibrahim, a 15 year old boy was working with Reinhart in Unity. He liked it so much that the two of them decided to meet again during the regular Eeklo Dojo. Two weeks later, Reinhart went to pick him up from the centre and Ibrahim attended the Dojo working with Reinhart and the other kids in the advanced Unity/Java track.